I had to replace my living room rug and purchased this one. Love the colors and seems to be holding up well to everyday wear. Great price! 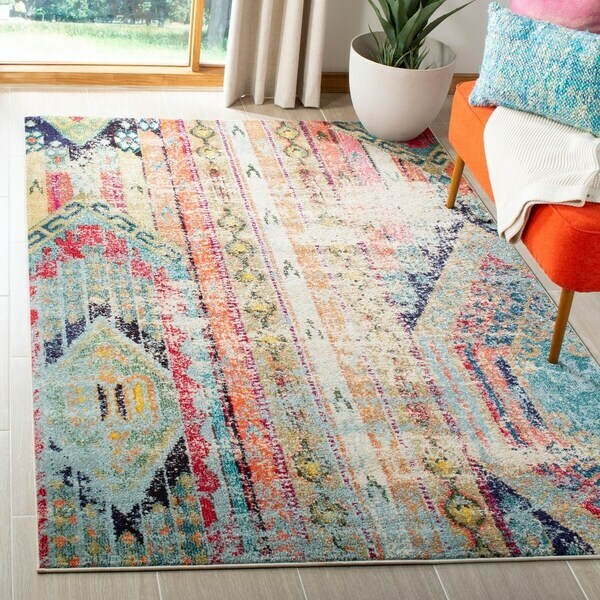 I ordered the Safavieh Monaco Vintage Bohemian Multicolored Distressed Rug and was so impressed with how beautiful,high quality they were,I also ordered the larger rug in that design and have a runner to match ordered that should arrive today! Yes, I highly recommend this product! This rug compliments every color in my home and I've received many compliments on it. 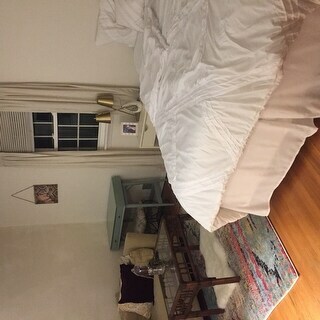 I have it in a gray room and although it has a cream base, it works perfectly! I have this carpet in two different sizes in two different homes. It just turns an ordinary room into a special place. Both rooms have a lot of traffic and they have held up great. They are a very forgiving rug for a very active family. This rug is gorgeous! I had been eyeing it up for my family room but in my excitement i didn't measure and had hoped the 5 x 7 would work. It was just a bit too small for the space and I was planning on returning it, but it's still sitting in my house because I really want to find a different room for it to work. I just love it so much! We haven't painted out living room or our master bedroom so I'm thinking I can make it work in one of those rooms! I was going to order it in the larger size but it was more than I was looking to spend. The 5 x 7 had been on sale for a great price. I went with the Safavieh Madison Bohemian Vintage in a larger size for the family room which I also love. 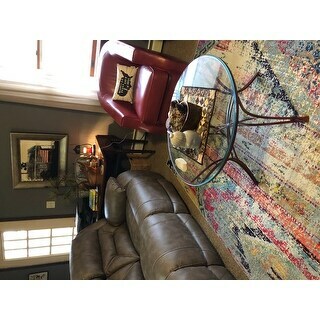 I will definitely be shopping o.co for any rug needs - they were great quality and as much as I compared prices all over the internet - I couldn't really find anything lower anywhere! Even though it was too small for me it still get's 5 stars because that was my mistake for not measuring and just hoping it would work! I ordered the 5X7.7 size for small apartment living room. It is very smooth texture and the color is so lovely! I purchased this rug and the runner for the foyer. I love these rugs. They are high quality and perfect for my living room and dining room areas. Highly recommended. Beautiful rug! I've purchased 3 different sizes of this gorgeous rug! Love the pattern and colors. Great quality and durability. Highly recommended! 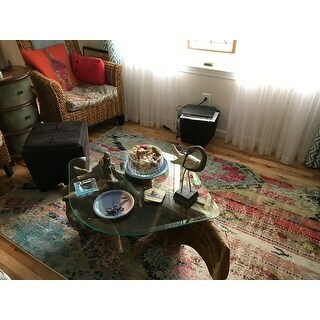 I was excited to receive this rug since it matches my furnishings so nicely. But after removing the plastic it was sent in, we immediately noticed a strong chemical smell. We aired it out in the garage for 2 days but the smell is still strong. It's now in a room with all the windows open but the smell has permeated the house. Hope it dissipates soon or we'll have to return it. Love the colors and how it feels. Not thick and plush but I'm ok with that. We bought this rug for our den. We have a small white loveseat and a small recliner chair that is brown so we needed some color bought into the room. This rug did the trick. It looks beautiful in the den. I'm thrilled with this rug, it's brought the room to life. I particularly like the clever way it's been woven to make it look 'worn and old'. Fabulous! This reminds me of a modern take on a Victorian rugs. It is the perfect touch in my otherwise simple guest room. 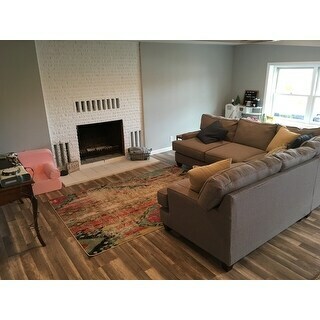 Looks just like the picture, received many compliments - I love this rug! I love this rug. I'm not a fan of oriental rugs because the colors are a little too jewel toned, but this is perfect with the pastels and lighter shades. I love the fading, it gives it a unique look. I have teal and gray curtains that look awesome with it and pops of orange and purple flowers in my sitting room. You can do so much with this rug. I highly recommend it! The rug is exactly as shown and described. Comfortable to walk and sit on. Nice muted color. I initially bought this for my kitchen, but decided to put at the front door as is represented the colors of that area and tied all of the colors together. Beautiful!!! I love the colors in this rug! It's perfect for our room with antique furniture. It's subtle with pops of color. I would recommend this item. The color is great. It goes with eveything. I love this rug! It is just as pictured! This rug is gorgeous! We love it! Came really fast and was packed very securely! 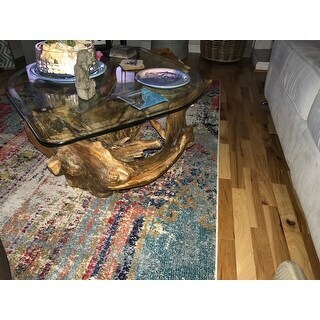 We bought it to pull our living room together and we are very pleased with the results! This is the prettiest rug in person. I previously bought the larger size for my dining room and decided to order this size for my breakfast nook. The colors are gorgeous without being too bright. Just the right punch of color for a room! This rug is not produced in size 12' x 14'. However it is available in various sizes including 11' x 15' and 12' x 16'. "Can this size of rug be ok to place it in the living room under coffee table ?" This rug should not have any issues supporting a coffee table. This rug is intended to be a 5'1" x 7'7". Please note sizes can vary up to a few inches. "I read about the odor and I'm concerned about that. Anyone else notice a pervasive odor from this beautiful rug?" I put this in my teenage daughters room the day I received it, I didn't smell any odor at all. "Does this come from China?" This rug is made in Turkey. No, this is made in Turkey. I love the subtle, but colorful appearance. It is not too loud. I would say that it is quite well made, too. Rug is made in Turkey Beautiful, vintage look. "Does this rug come in round 6' or larger? And is this rug more neutral compared to the Monaco style rug?" There are several round options in this rug. Type in vintage bohemian round and check them out. Yes this rug seems to be more toned down than the one you mentioned. Its not as vibrant but still bright with more of a distressed tone. "Does this come in 6x8?" "Is the dark color a blue or black?" It is a blue color. I have this rug in my baby’s room it’s beautiful. 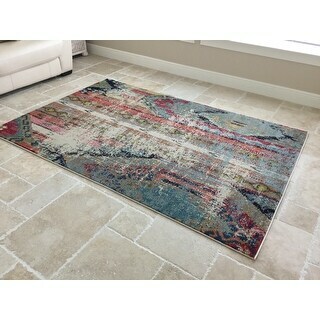 Safavieh Monaco Vintage Bohemian Light Grey / Multi Distressed Rug - 5'1" x 7'7"